“Rinser” is a toothbrush with a built-in Power Fountain! You can brush without using a cup or using your hand to rinse your mouth. Clever. Amazing concept but wouldn’t it waste a lot of water compared to an old fashion cup? I was going to post a snarky comment on solving non-existent problems. but i don’t have the energy. now if it could float like in the pic, that’d be awesome. 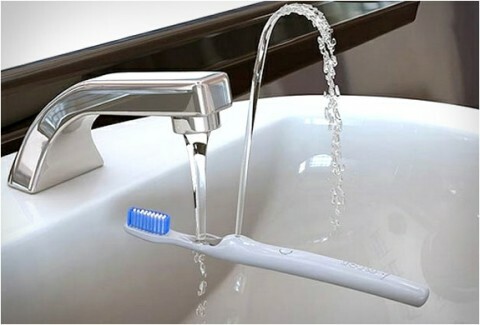 i suppose this saves a bit more water than brushing your teeth in the shower. Though this might be useful if you dont want to waste a plastic cup in your hotel room. You can also rinse your mouth (if you want to rinse, as I agree, it is not compulsory) going downward 10 more centimeters to reach the water coming out of the tap directly… Less water wasted, no need of a plastic or paper cup if you’re in an hotel room (anyway, most hotel rooms have glasses and not paper or plastic cup). I agree, it’s a smart design, but it’s just that. Genius. Total genius in its simplicity. As to wasting water-how about not taking 30 minute showers? Such an excellent idea, amazing. Water bill would be five times as much.